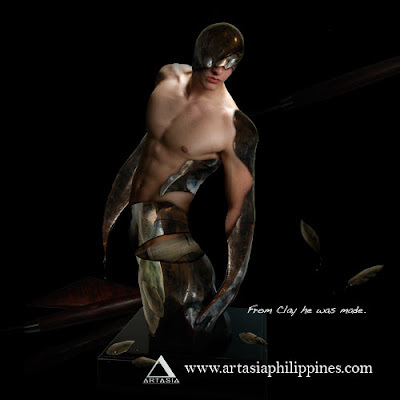 Here's a little graphic manipulation I designed two years ago for the Artasia Gallery's promotion. It's a rough patchwork resembling a humanoid subject melded into a dark forest abstraction. I found the play of subjects an interesting combination, because I see sculpture as man's master creation, just like God sees man as his master creation, forming him out of natural earth and minerals. For me, abstract composition is an interesting concept, because it allows today's contemporary artists to evaluate society in terms of opinion, history and bias. What's more interesting is that abstraction can meld these things together to create expressive arts that can range from the representational humanshape figurines, to pieces inspired by surrealism and dadaism conveyed in the most simplest of contours.